After almost 4 decades of service with the Westmont Police Department, Police Chief Tom Mulhearn is retiring. His retirement will become official on Oct. 7, 2016. Mulhearn began his law enforcement career in 1974 as a Cadet/Dispatcher for the Broadview Police Department. In 1977, he became a Police Officer with the Westmont Police Department. Over the years, Tom has held many positions with the Westmont Police Department including Patrolman, Detective, Juvenile Officer, Sergeant, Detective Division Commander, School Resource Officer, Deputy Liquor Commissioner, Deputy Chief of Police, Acting Chief of Police, and Chief of Police. Tom served as Westmont Chief of Police for 7 years from 2009 to 2016. Chief Mulhearn earned a number of awards and accolades during his time with the Westmont Police Department. In 1998, Tom received the Joseph T. Gurak Memorial Award as Juvenile Officer of the Year for DuPage County. He was elected President of the DuPage Juvenile Officers Association in 2002. He began the Westmont School Resource Officer Program in 2007. In March of 2007, Mulhearn received the inaugural Public Safety Officer of the Year Award from the Westmont Chamber of Commerce. In 2008, he received the Paul Harris Fellowship Award from the Westmont Rotary Club. Tom has also served as the First Vice President of the DuPage County Chiefs of Police Association. Tom is currently a member of the Westmont Rotary and the Westmont Lions. Mulhearn graduated from Triton Community College and completed his basic law enforcement training at the Chicago police Academy in 1977. He has attended additional training at Northwestern University, the University of Illinois, and the U.S. Department of Homeland Security Center for Domestic Preparedness. In 2007, he attended the FBI’s National Academy in Quantico, VA and is currently a member of the FBI National Academy Alumni Association. The Village of Westmont thanks Tom for his many years of dedication and service. We wish Chief Mulhearn a long and happy retirement. 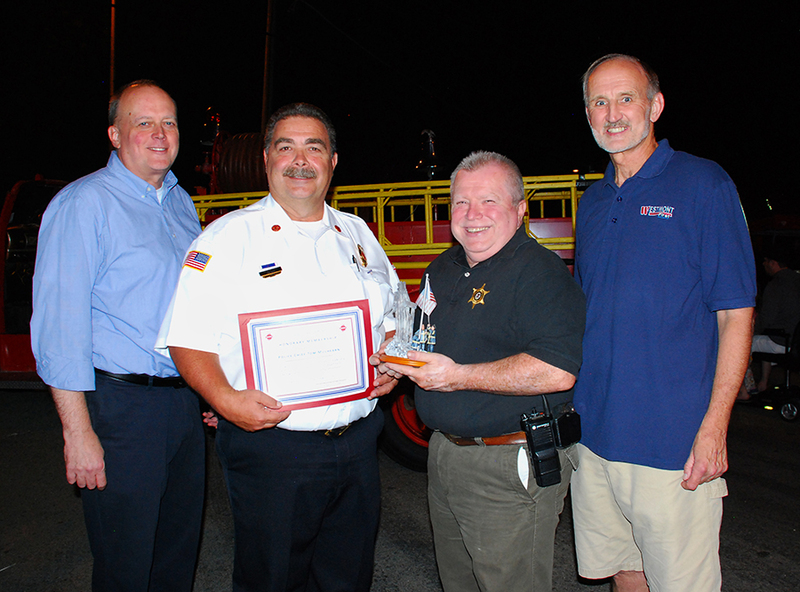 PICTURE CAPTION: Retiring Police Chief Tom Mulhearn is recognized by the Westmont Fire Department and made an honorary fireman at the Westmont Street Fair & Fire Truck Night on Thursday, Aug. 25, 2016. Left to right - Village Manager Steve May, Fire Chief Dave Weiss, Police Chief Tom Mulhearn, and Mayor Ron Gunter.